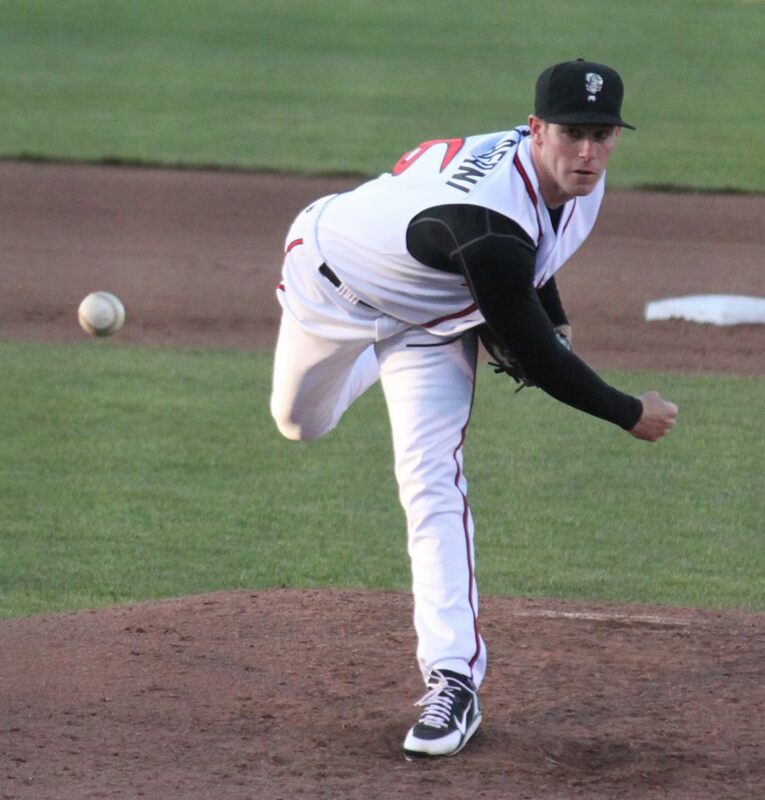 Cincinnati Reds starting pitcher Anthony DeSclafani started his professional career in the Midwest League as a member of the Lansing Lugnuts. Later this week, the right-hander will return to the MWL as a rehabbing major-leaguer with the Dayton Dragons. DeSclafani started the season on the disabled list with a strained oblique suffered near the end of spring training. He made his first rehab start Saturday, giving up three runs on five hits and a walk while striking out five in four innings for the Double-A Pensacola Blue Wahoos. His next rehab start will be for the Dragons at Fifth Third Field on Thursday. He will face the Kane County Cougars that night before returning to the Reds rotation next week. DeSclafani pitched for the Lugnuts in 2o12, a season that saw a lot of future major-leaguers play in Lansing. He went 11-3 with a 3.37 ERA, 92 strikeouts and 25 walks in 123 innings (28 games/21 starts). The Lugnuts pitching staff also included RHP Noah Syndergaard (8-5, 2.60 ERA, 122 strikeouts, 31 walks in 103.2 IP), RHP Aaron Sanchez (8-5, 2.49 ERA, 97 strikeouts, 51 walks in 90.1 IP), LHP David Rollins (6-1, 2.78 ERA, 75 strikeouts, 36 walks in 77.2 IP) and LHP Justin Nicolino (10-4, 2.46 ERA, 119 strikeouts, 21 walks in 124.1 IP). The 2012 Lugnuts had some future major-leaguers on the offensive side, too: outfielder Kevin Pillar (.322 BA, 5 HR, 57 RBI, 35 SB in 86 games), catcher Carlos Perez (.275 BA, 5 HR, 40 RBI in 71 games) and outfielder Dalton Pompey (.227 BA in five games before playing full season with Lugnuts in 2013). DeSclafani made his MLB debut for the Marlins in May 2014 after Miami acquired him from the Toronto Blue Jays in a blockbuster trade in November 2012. He was traded to the Reds for RHP Mat Latos (2008-09 Fort Wayne Wizards/TinCaps) in December 2014. This entry was posted in Dayton Dragons, Fort Wayne TinCaps, Kane County Cougars, Lansing Lugnuts, Midwest League, Pensacola Blue Wahoos, Southern League. Bookmark the permalink.